A national survey conducted in 2009 by Americans for Sovereignty® found that the American people overwhelmingly rejected the creation of a North American Union. The degree of opposition rose from previous surveys of public opinion concerning a merger of the United States with Mexico and Canada. The survey was sent to over 42,000 people. Given all the recent publicity concerning the Canadian health care system, opinion was nearly unanimous in this survey that any North American Union would burden Americans with costly medical care of not only Canadians, but also Mexicans. Moreover broad fear existed that the lavish social welfare programs, that have nearly bankrupted Mexico and Canada, would also become a new burden for the American people. In recent months increasing discussion has arisen over the future of the American currency. This survey also found overwhelming support for the continued use of the dollar and firmly rejected the creation of a new Amero that would replace the currencies of the U.S., Canada and Mexico. Similarly the survey found that 98% of respondents believed that English should remain the medium of communication in the United States and we should not a adopt a tri-lingual system of legally recognizing both Spanish and French as official languages along with English. The survey found much greater awareness of the nearly secret negotiations that have been taking place between government bureaucrats in the United States, Canada and Mexico. A broad concern existed that American sovereignty could vanish in any North American Union just as national borders and cultures are being obliteration in the European Union. Just as unelected bureaucracies in Europe have increasingly replaced Parliaments in making key decisions, the survey found a growing concern with role assumed by bureaucrats in our own government. Due to the concerns of the direction of negotiations concerning a prospective North America Union, the survey found nearly unanimous sentiment that the United State Congress should "stop any further planning and disclose every detail of their work thus far" that has taken place under the innocuous sounding Security and Prosperity Partnership. Americans for Sovereignty® is a project of Council for America®. 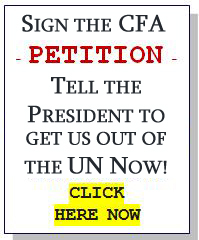 With over 25,000 supporters it is one of the largest organizations in the United States that focuses its attention on issues effecting continued American sovereignty. Through its surveys, petition drives, the Congressional Scorecard project and other educational programs, Council for America® informs the public about growing international threats to American sovereignty and works to thwart such threats.